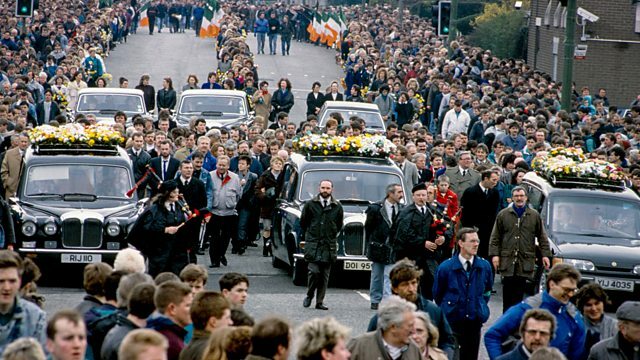 Documentary offering a range of perspectives 30 years after a dramatic and deadly series of events that took place at two funerals in Belfast in March 1988. A new documentary by acclaimed film-maker Vanessa Engle, The Funeral Murders follows a dramatic and deadly series of events that took place at two funerals in Belfast in March 1988. Thirty years later, those who witnessed or were intimately connected to these events tell their stories. This film offers a range of perspectives - from republicans and loyalists to the security forces and family members of those who died, who share their moving stories for the first time. The chain of events began when three members of the IRA on a mission in Gibraltar were shot dead by the SAS on 6 March. The three were unarmed when they were killed, but one of their cars was later found containing explosives,which they planned to use to bomb an upcoming parade of the Royal Anglian Regiment in Gibraltar. At their triple funeral ten days later, loyalist paramilitary Mchael Stone launched an attack in the cemetery using guns and grenades which killed three people, including IRA member Kevin Brady, and injured 60 others. At Kevin Brady's funeral three days later, two British army corporals, Derek Wood and David Howes, drove down a main road in West Belfast towards the funeral cortege. Mistaken initially for loyalist paramilitaries mounting another attack, and subsequently thought to be members of the SAS, they were beaten and killed by some members of the crowd. Now, thirty years on, Vanessa Engle wants to try to understand these events, one of the darkest chapters in the history of the conflict in Northern Ireland, and find out what it means today. Featuring previously unheard testimony as well as archive footage, The Funeral Murders documents the fortnight in 1988 in forensic detail, painting a picture of the shocking events as they unfolded.